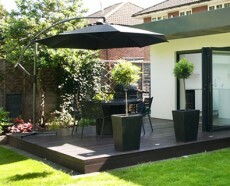 Making Room in Your Home - Tips on Building Extensions. Finding the perfect home can be a long and stressful process. Sometimes, it takes years to settle on just the perfect place for you and your family. Once you’ve settled into that ideal location; the best school district, the nicest view, the friendliest neighbors, and the greatest local community, you don’t want to move. But, what if your family grows or you just need more space? Then, you may want to consider building onto your existing property. When planning an extension, there are several important questions to answer before getting started. Who will do the work? What part of the house should be built onto? How much extra space do you need? Which rules and regulations need to be followed? Is your neighborhood considered an historical district? Do you have a homeowner’s association that has certain restrictions? Are there any tax incentives or consequences to building? Before you sink a ton of cash into a new home improvement project, take the time to consult the right people. In most cases, any new addition to your home will need to be approved first by your local municipality. Most cities have very specific rules regarding how close to the neighboring house you can be, how far from the street you are, and what kind of structures are allowed. Plans must be drawn up and submitted for approval before any work can begin. All of the plumbing, wiring, and framing must be reviewed and signed off on by the proper authorities. The best way to learn about what you can and cannot build is by contacting your city’s development services division. Sometimes this can be done directly and sometimes it can be done through your builder. Another important decision will be who is going to do the work? The easiest way to answer this question is by assessing your own skills. Obviously, if you have no experience with construction or electrical work, you’ll have to hire a professional to help out. Often, homeowners decide to have the main structure and wiring done by a construction firm, and then handle the drywall, insulation, and smaller details themselves. Whichever you decide to do, keep safety first and foremost. You won’t want your investment destroyed by a wiring or plumbing disaster. There can also be some important tax implications related to extending your home. If you plan to install energy-saving features, you can often get a tax credit from the IRS. Speaking with your family’s financial advisor or to your local tax preparer can help you decode some of the details of tax rules and regulations concerning your new addition. Another good source of information can also be your local energy company. They may be able to make recommendations of what materials and supplies can save you money on your monthly bill. Gather a team of reliable sources that can help you decide on the best way to go about building an extension to your house. Realtors, tax advisors, local agencies, and even neighbors can all be great sources of information that will help you make the best decisions going forward. It can be helpful to sit down and write a list of questions to clarify your thoughts when seeking advice. A bit of preparation now will save a lot of headache down the road. The photo has been viewed 12153 times.